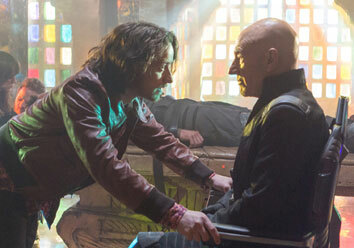 With the world devastated by war, and mutants in particular facing extinction, Professor Charles Xavier (Patrick Stewart) and his long-time friend/occasional enemy Magneto (Ian McKellen) hatch a plan to send Wolverine’s (Hugh Jackman) consciousness back in time to his younger self in the 1970s in X-Men: Days of Future Past. Patrick Stewart, who has played Charles Xavier/Professor X for over fourteen years, was not surprised that his character was returning in Days of Future Past. The success of the franchise has been impressive and Stewart could see where the stories were headed. And besides, “It’s going to take James McAvoy a year or two before he actually looks like me,” he jokes. Stewart was happy to again work with Singer, whose vision has helped define the ambitions and success of the films. One of the changes Stewart has witnessed over the years is the approach to setting up a project of this scale. He had never before worked on a 3D film nor seen animated pre-visualizations of his scenes. The process has become more complex but also more precise, all of which excited Stewart almost as much as finally flying the X-Jet. Moreover, this time Xavier has a wheelchair that “actually hovers!” he marvels. “Bryan was already a very mature filmmaker when we started working on the first X-Men movie. I think one of the ways he has changed is that Bryan has now become much more sensitive and intimate to an actor's way of working and preparation, and has absorbed that into his directing style and technique. That's something I was very much aware of when we were filming Days of Future Past,” Stewart continues. X-Men: Days of Future Past is the biggest X-Men film to date, a validation of the success of the franchise, but more importantly a culmination of tremendous creative energies from its cast and filmmakers. It is a story that reaches across all boundaries to all audiences.